What’s Next for Fleeing Saudi Woman? 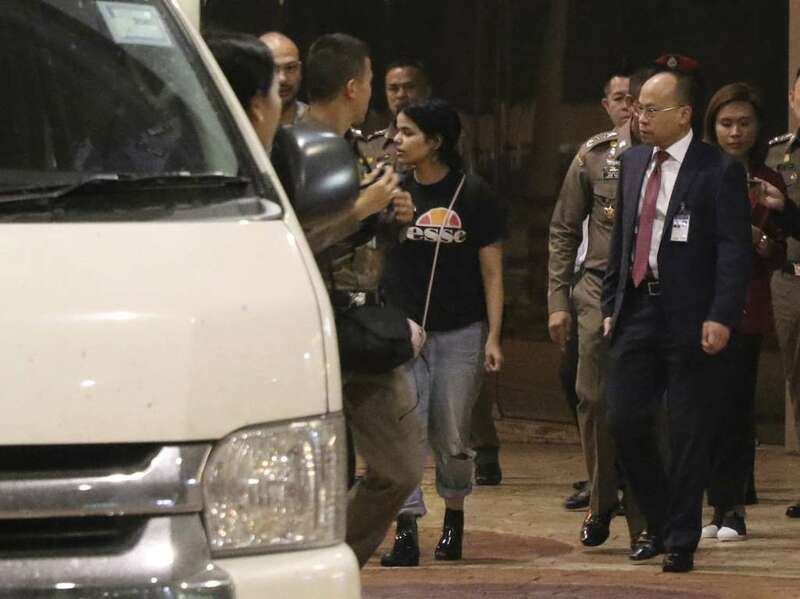 BANGKOK — Rahaf Mohammed Alqunun, the 18-year-old Saudi woman who fled her family and avoided deportation from Thailand by barricading herself in an airport hotel room and posting about her plight on social media, spent her first day of freedom in Bangkok on Tuesday. After appearing to be headed for deportation back to her family, whom she accused of abusing her, Ms. Alqunun won a reprieve from the Thai authorities on Monday night. Those officials turned her case over to the United Nations Refugee Agency, which will take up to 10 days to process her request for refugee status and find a country that will accept her. Those days will be critical to her fate. Even as Saudi officials continue to lobby the Thai government to send her back against her will, United Nations officials have begun gathering information to determine whether she qualifies for refugee status and eventual asylum. Here is the path ahead for Ms. Alqunun. Ms. Alqunun is in the care of the United Nations Refugee Agency, also known as U.N.H.C.R. After leaving the airport on Monday night, she is staying at an undisclosed hotel in Bangkok, and could not be reached for comment on Tuesday. Thailand’s immigration chief, Maj. Gen. Surachate Hakparn, who met with Ms. Alqunun at the airport, said that agency representatives would take up to five days to determine whether she qualifies for refugee status and, assuming that she does, another five days to find a place for her to resettle. The refugee agency will try to find a country to accept her and will make the case that her situation is urgent. Refugees often wait years for placement. Likely candidates for Ms. Alqunun include Australia, where she had originally hoped to go, Canada, New Zealand, the Netherlands and the Nordic countries, said Phil Robertson, the deputy Asia director for Human Rights Watch. “I want Canada to give me asylum!” she said in a post on Twitter after she left the airport. If more than one country agrees to take her, it will be up to the refugee agency to decide where she goes under a policy aimed at preventing refugees from country shopping. “She is not going to have a choice,” Mr. Robertson said. Thai immigration chief, Maj. Gen. Surachate Hakparn, right, and United Nations officials at Suvarnabhumi Airport in Bangkok on Monday. What is her family doing? General Surachate said Ms. Alqunun’s father and brother were expected to arrive in Bangkok on Tuesday. Ms. Alqunun expressed concern on Twitter that her father might find a way to compel her to go back to Saudi Arabia. The kingdom has strict guardianship laws that allow men to control nearly every aspect of women’s lives, including the right to travel, obtain a passport, marry or divorce. But the family’s best chance at getting her back would have been through deportation while she was stuck at Suvarnabhumi Airport. It could be much more difficult now that she is under the protection of the United Nations. Ms. Alqunun slipped away from her family while they were on holiday in Kuwait and flew to Bangkok on her own. She said earlier in interviews with The New York Times that her brother frequently beat her and that her family had kept her locked in a room for six months after she cut her hair in a way they didn’t like. If she can establish that she faces death or brutality at home, she has a strong case for refugee status. General Surachate met with Saudi Arabia’s ambassador to Thailand, Abdul-Ilah al-Shuaibi, and other Saudi officials on Tuesday to discuss the case. The Saudis said the matter was a family affair and that Ms. Alqunun needed medical attention, according to video clips of the meeting released by the Immigration Bureau. The Saudis also complained that Thai officials had not confiscated Ms. Alqunun’s phone, allowing her to build up a large following on Twitter and bring worldwide attention to her plight. Does this mean Thailand is changing its asylum policies? Thailand’s decision to allow Ms. Alqunun to remain in the country was relatively unusual, given that it is not a signatory to international agreements on refugee status and has a history of handing asylum seekers back to authoritarian countries, including China, Pakistan and Turkey. A former star soccer player from Bahrain, Hakeem al-Araibi, has been held in Thailand since November even though he has refugee status in Australia. Thai authorities detained him on a warrant from Bahrain when he landed in Bangkok for his honeymoon. He fears he will be tortured if he is sent back to Bahrain. General Surachate said that allowing Ms. Alqunun to remain in Thailand would have no bearing on Mr. Araibi’s case because it is now under the jurisdiction of a Thai court. China’s brutal crackdown on Uighurs shows no sign of slowing down – so why aren’t Muslim leaders stepping in? wow. All refugees are getting jealous. A UNHCR decision within days, no hours. ‘Normal’ refugees may wait for years for such a decision. Presumably because she was clearly in immediate danger, and the world was watching, utterly horrified. Just to clarify: I am not against this lady having been granted refugee status. I am however for UNHCR to speed up their case works on all other refugee applications too. It seems to help to be : (1) Saudi (2) a girl (3) denouncing Islam (4) abuse victim ?? ?